Your child is now running, jumping and climbing. Some children are more confident than others, their dare-devil antics at home and in the playground can give their parents grey hairs. Fine-motor activities become more intriguing. They are discovering how the world works and how they can make things happen. 2 – 4 year olds become more aware of other children and, closing in on age 3 they start to play together instead of just next to each other. Give your child as many opportunities to get dirty as possible by playing with sand, mud, playdough and paint, not just at playgroup or preschool, but at home too. Introduce simple perceptual games and puzzles to provide problem solving opportunities that come with matching things together. Children in this age group are either in playgroup or preschool where they have to learn to share and take turns, as well as listen to, and follow, simple instructions. As a parent you are still very much in the equation playing with your child and tidying up together afterwards. The miracle of vocabulary development is remarkable at this stage as they learn new words everyday and start stringing meaningful sentences together. What an adventure! Print out your Gift List Planner here so that you can doodle away and ensure you don’t forget anyone. 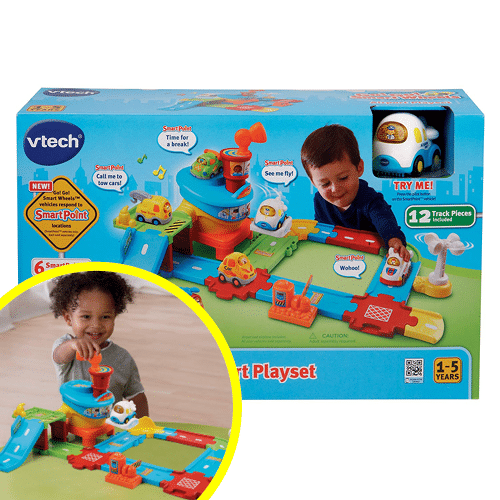 This sturdy interactive vehicle and track set is a little airport that comes with a Toot Toot aeroplane. When the vehicle rides over the six Smart Point Sensors on the track, they trigger sound effects such as filling up with fuel, fun phrases, songs and more. Purchase extra Toot Toot vehicles to extend play. This set is connectable with other Toot Toot playsets too. First up you will have to build the track for your child. As they get older the will learn to build it by themselves which stimulates spatial planning and problem solving skills to create a track that enables their vehicles to whiz around, up and down. Enrich your special night time story telling ritual with your child with is easy to use storybook projector that clips onto your phone. It uses your device’s flashlight to project vibrant storybook images onto any surface such as the ceiling or a cupboard door. Click/turn the story reel as you go to change the picture for the page you are reading. Read classic stories such as The Very Hungry Caterpillar, Spot, Mr Men Compatible with most major smartphones. 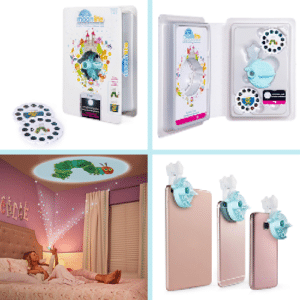 Each set includes one Moonlite projector, a number of story reels, one activation card and quick start guide. Choose from a two or five story starter pack, and you can purchase additional stories separately to build your library (approx R150 per story). This immersive reading experience will instil a love of learning, reading and listening at an early age. 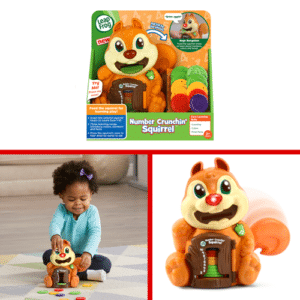 Feed coins to your hungry squirrel to explore counting, colours, food names and early maths concepts. The different coloured coins represent different foods such as apples, strawberries, grapes and bananas. Press the squirrel’s nose and he will tell you what to feed him and how many. Then empty the squirrel’s tummy by pushing down his tail. Press the acorn button to hear four learning songs. Includes ten coins to practice counting to ten and bonds of ten. This ten pin bowling with a twist. Each of the pins is made up two pieces that click together. 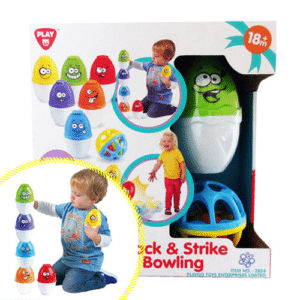 In addition to playing ten pin bowling with the ball provided, the pins can be stacked on top of each other to create towers which requires matching the shapes on the ends in order to build the towers. Also great for use in the bath and can be used for both stacking and nesting. This product will last a long time as it can be played with babies right up to four year olds. Why not hide small toys or items such as a bell inside the pins for added interest? These sturdy transformer vehicles go from ground to sky. They transform at the flick of the wrist from a wheeled vehicle that you push along to a flying vehicle for fantasy play. The four characters include Marshall, Chase, Rubble and Skye. They all come with a disc and dart launcher, shooting little tennis balls, darts etc. The rescue hook is for picking up pups and taking them to safety. Paw Patrol is about bravery, friendship and teamwork. Bingo Nimo is a fun first colour matching, puzzle building game. Collect all five of the matching pieces to fit into the animal frame by taking turns to throw the colour dice. The winner is the first player to collect all the parts needed to complete their animal. Alternatively, a child can sit and build each puzzle one-by-one. As the pieces are all different shapes, it’s not as easy as it looks. However, the pattern on the pieces and shape guide on each animal act as a good guide to what pieces go together. A multi-purpose game and puzzle-building activity that is great value for money. 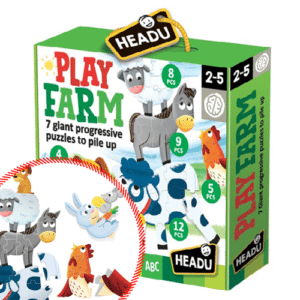 Consists of seven progressive farm-themed puzzles with large, super-robust pieces. 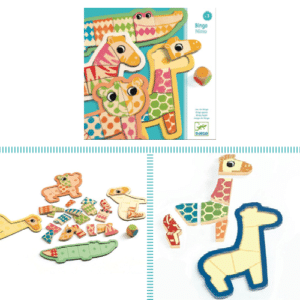 The animal puzzles can be piled up on top of each other, in order, from largest a the bottom to smallest at the top.This is called seriation and it is a perceptual skill for school readiness. Stimulate your child’s eye-hand co-ordination, manipulation, spatial planning and problem solving skills. The seven puzzles are 2-4-5-6-8-9-12 pieces respectively. 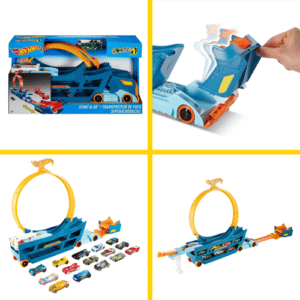 A 3-in-1 Hot Wheels track and 18 car storage vehicle carrier that is also a push truck. Transforms into a ramp with a elasticised launcher that will stimulate your child’s fine-motor control as they work out how to use it. 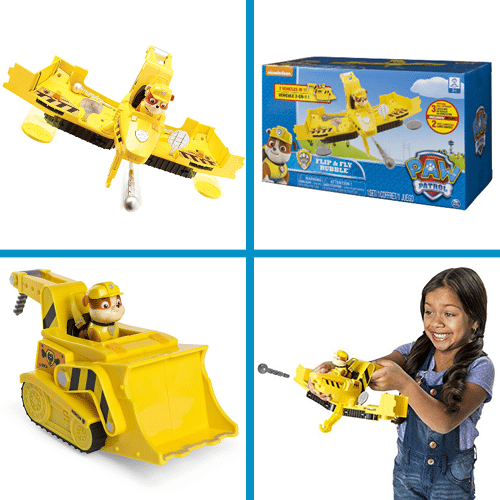 Great fun on the run – pack up all cars and track pieces and store as part of the truck. Take it anywhere. Twist, wiggle and go with no batteries and no pedals. This tricycle moves as your child wiggles the steering wheel. Great for indoor and outdoor play on smooth surfaces. 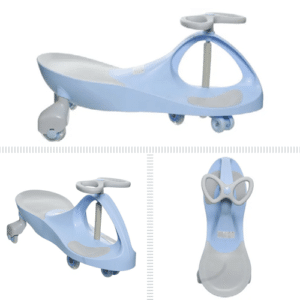 Your child will love the smooth, gliding motion. It’s safe and durable and comes in different colourways. Good for developing your child’s core stability. The LEGO DUPLO Cargo Train has a Push & Go Motor. Gently push it forward or backwards and that’s all it needs to be on its way. Touch the train firmly or lift off the tracks to make it stop. Place the five coloured action bricks along the track to activate the horn, turn the lights on and off, pause and refuel, change direction and stop the train wherever they like. With a harbour, boat, cafe, loading station, 2 cranes, 3 DUPLO figures plus an animal figure and lots of cool track pieces included in this LEGO DUPLO set, pre-schoolers can enjoy classic, fun train play. Download the optional app to unlock even more play possibilities, including remote-control function for a tablet and fun activities to complete with your toddler! 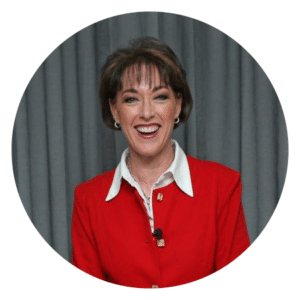 Nikki Bush has long been regarded as a sane voice in a world full of confusing opinions and choices when it comes to child development and parenting. She founded Toy Talk® 12 years ago to provide parents with trusted, independent opinion when it comes to the toys and games they buy for their children. Toy Talk® tracks trends, innovations and what’s new on the market as well as championing classic evergreen items that every child should have in their toy cupboard. Nikki understands how time-starved busy parents are today and her highly recommend short-list of games and toys helps make shopping easy and painless because parents can shop with confidence knowing that what Nikki recommends is tried and tested. Nikki recently partnered with takealot.com, South Africa’s leading online retailer to make the games and toys she recommends more accessible and convenient to parents everywhere, with deliveries to your doorstep. Her Toy Talk 2018 festive recommendations form part of a bigger picture with monthly themed advice regarding appropriate products for specific areas of your child’s development, helping you to be the best parent you can be.